In the mid-80s, Lt. Col. Rick King received his first Army rank, being commissioned a second lieutenant through Western Maryland College. Now, after 21 years of military service, he is the one doing the commissioning at Sam Houston State University, as the newly-named leader of the military science department. 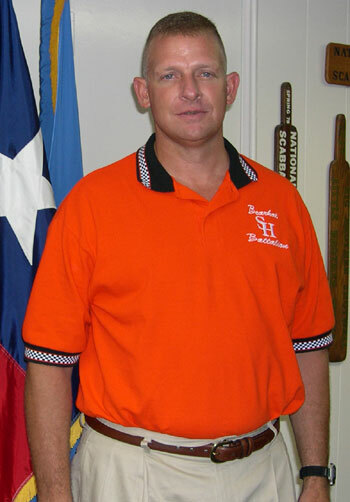 King, who was assigned to SHSU at the end of May after Lt. Col. Alan Mooneyham’s retirement, officially took over as department chair June 15. The Maryland-born, Texas “transplant,” was assigned to SHSU from Texas A&M University, where he oversaw approximately 750 in the Corps of Cadets. Not the type of guy anyone “ever thought would go into the ROTC, get commissioned, become an officer and continue on,” King entered the program at the encouragement of his father and was assigned to infantry upon his completion. “ I’m the first military officer in my family,” he said. “It (joining ROTC) was really just for the opportunity, the training, and I probably needed a little discipline at that time, and then I liked it. Fort Benning, Ga.; Fort Lewis, Wash.; and Schofield Barracks, Hawaii, as well as Thailand, Japan, the Philippines and Guam, among others, before being assigned to ROTC programs at University of Scranton and Texas A&M. In addition, in April 2003, he was assigned to Central Command Headquarters, the overall command for Iraq and Afghanistan, where he worked with the coalition force in Tampa, Fla., in support of the war on terrorism. “ In my capacity, I worked in J-5, in the coalition coordinating center,” King said. “Basically my job was to coordinate with the 53 countries in Tampa to support the war on terrorism both in Afghanistan and Iraq by providing additional forces and supplies in the country. Some of the other countries would provide money, humanitarian assistance and things of that nature. After his three-year assignment was up at A&M, he competed with about 80 other lieutenant colonels on a “primary list” who wanted a similar job for an assignment by the promotions board. “ I wanted to stay in Texas. I’ve always heard of Sam Houston State,” said King, adding that he’s always enjoyed the Texas culture. “I knew it is in Huntsville, it is a smaller college, and the ratio of students to faculty was smaller, which I think is a big reason students come here. For me, personally, I think the 12,000-14,000 students is perfect. “ When I did visit the school, everybody was really friendly, and they did have a really good ROTC program, so I was coming into a successful ROTC program,” he said. Among his many goals at SHSU is to continue in the steps of his predecessor and help to see the program grow through increasing the numbers of recruits, as well as helping to increase retention through students’ junior and senior years. In addition, he wants to use his own experiences with the military to help train junior officers by what he thinks they “need to know before becoming platoon leaders and leading men and women. “ Ever since I was in ROTC, way back in the 80s, I felt that in my experience in ROTC as a cadet that the cadre could have done a lot more to help me out before I was a lieutenant,” King said. “I’ve always wanted to work with ROTC, and I have now, twice. King’s wife, Lisa, is the associate director for the Texas A&M MBA Career Services department, but he said she will be on hand to show her support to the program, its cadets and the cadre.